The S&P 500 lost as much as 229 points or 10.92% in three days. The Nasdaq lost as much as 763 points or 16.77% over the same three days. Wow. To be honest, I did not see that one coming, at least not as intense. 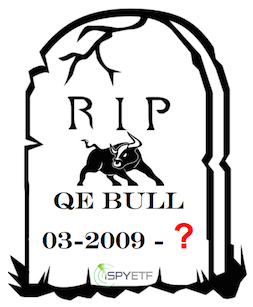 However, there were tell tale signs – a writing on the wall – that a big selloff is a real possibility. There was no reason for us to own stocks. 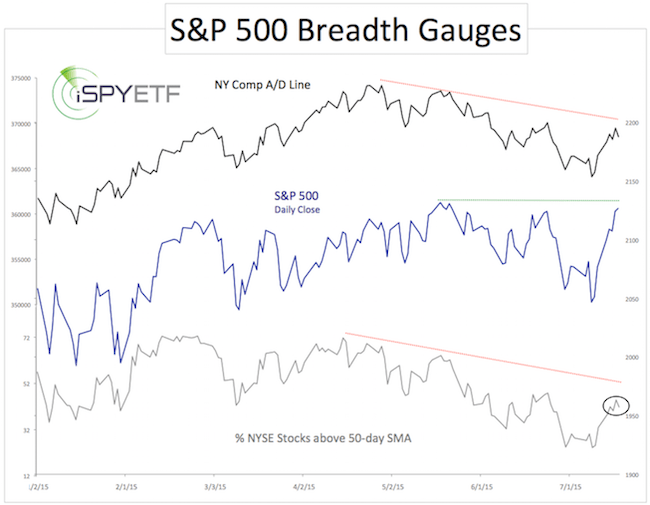 We have looked at the market’s internal deterioration (‘bad breadth’) many times in recent weeks (the last time was here). Elliott Wave Theory. Some love it, others hate it. I’ve found that there are times where EWT is very helpful, if interpreted correctly. What is a wave 3? The third wave of an Elliott Wave pattern is always the most powerful one. It generally goes further than expected. Elliott Wave Theory may hold the most clues about what’s next for stocks. Based on the intensity of this selloff, it is likely to turn into a 5 wave decline with a more lasting low in October, similar to 2011. Here is how things looked and turned out in 2011. As far as indicators go, gold seasonality has been on fire. From January 22 – July 24, gold prices tumbled 17.8%. Gold and gold ETFs already soared 6.9% since the August 6 seasonal gold low. 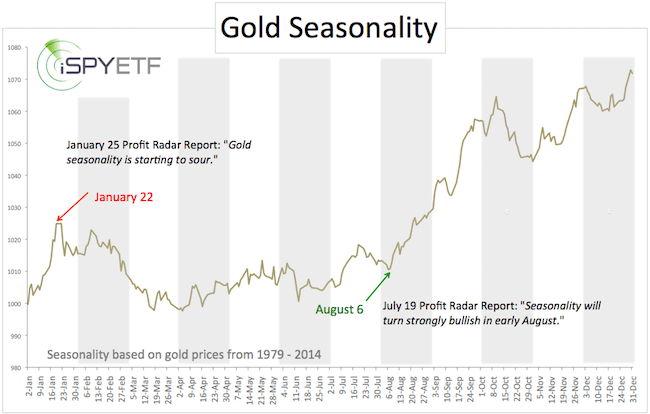 The gold seasonality chart projects further gold gains until early October. This, by the way, does not mean that there won’t be any pullbacks. Meticulously hand-crafted seasonality charts for all major asset classes are available to subscribers of the Profit Radar Report. Gold seasonality is only one indicator, but it wasn’t the only indicator suggesting a gold rally. 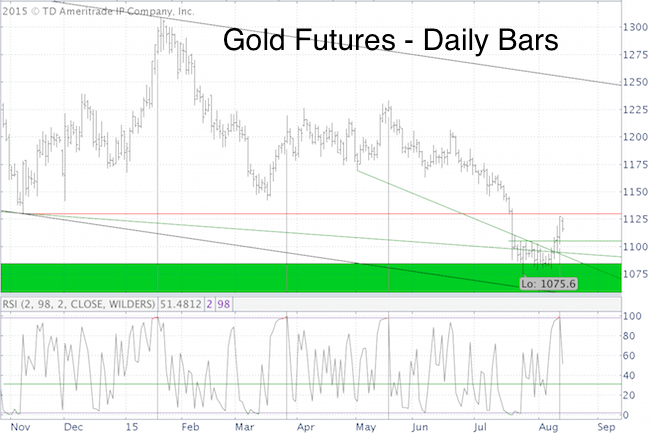 The July 21 article “Gold Looks so Bad, it Might Actually be Good” highlights 3 bullish gold development. 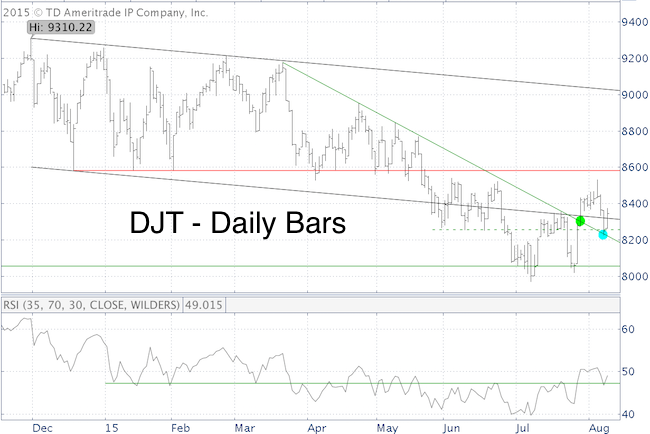 Technical analysis also suggested that a tradable bottom was formed on July 24.
Commodities have become a focal point, usually as scapegoat or precursor of bad things to come. Most major commodities (including oil, gold, silver, copper, lumber and grains) have collapsed. Many believe this is reflective of a weakening economy. I won’t enter this debate, but rather offer a look at a long-term, broad commodity chart. 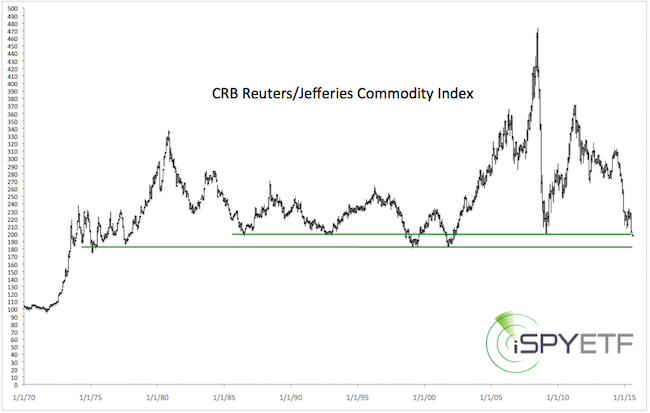 Shown below is the CRB Reuters/Jefferies Commodity Index. This index consists of 19 commodities: aluminum, cocoa, coffee, copper, corn, cotton, crude oil, gold, heating oil, lean hogs, live cattle, natural gas, nickel, orange juice, silver, soybeans, sugar, unleaded gas and wheat. There are two main support areas. The index is threatening to break below the first one, and currently trading about 10% above the second one. More down side is still possible and picking a buttom is like catching a falling knife, but the closer trade gets to support, the higher the odds of a bounce. Although the corresponding commodity ETF – the PowerShares DB Commodity Tracking ETF (NYSEArca: DBC) – hasn’t been around as long as the CRB Reuters/Jefferies Commodity Index, it too is nearing support. A rip current is a powerful, fast-moving flow of water running from the beach back to the open ocean. About 80% of lifeguard rescues are related to rip currents, and about 150 people are killed by rip currents every year (just in the US). Lifeguards and experienced swimmers/surfers can detect rip currents, and know what to do, but they are invisible to novice swimmers. The stock market is full of rip currents, that’s why some investors sink (often because they don’t think) and others swim. Here are some of the cross currents lurking beneath the surface. 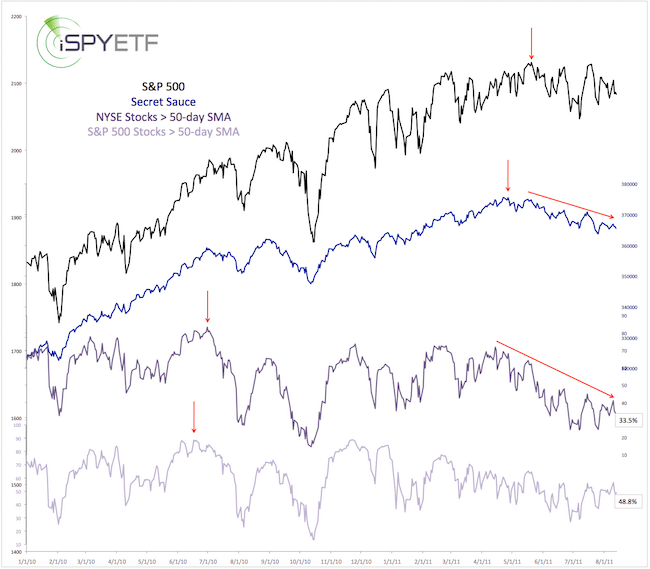 The chart below plots the S&P 500 against the percentage of NYSE and S&P 500 stocks below their 50-day SMA, and my favorite indicator (I call it ‘secret sauce’). Secret sauce is an incredibly potent indicator, and is the most important ‘bull market health meter’ I’ve found. 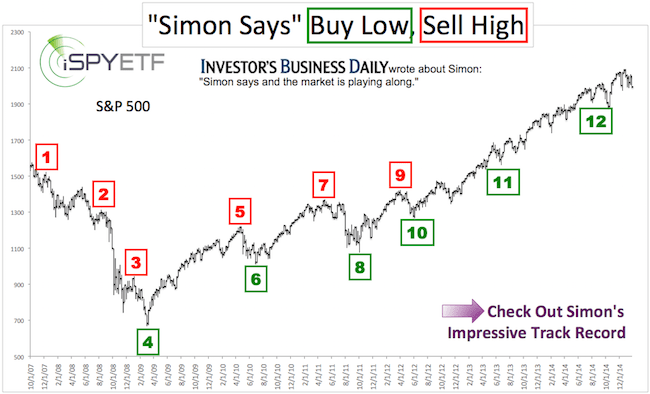 Up until April 2015, secret sauce has been giving the ‘all clear’ signal, meaning that higher highs were still to come (it never triggered a ‘danger’ signal from 2009 – 2015). That’s not the case anymore. In fact, currently secret sauce is showing the same warning signals it flashed before the 1987, 2000 and 2007 bear markets. The percentage of stocks above their 50-day SMA has been declining since 2012/2013, but the lag accelerated in April. Large cap stocks are holding up much better than the rest of the market. How so? 48.8% of S&P 500 stocks are above their 50-day SMA, but only 33.5% of NYSE stocks. The NYSE Composite is comprised of some 3,500 issues, including (and predominantly) small and mid cap stocks. The S&P 500 consists of the 500 largest U.S. corporations. A quick glance at the Russell 2000 chart, which just dropped to new lows, confirms the lagging performance of small caps. Small cap underperformance is one of the 3 stages of a dying bull market (click here for the anatomy (3 stages) of a dying bull market). Market breadth is warning that the stock market is trying to drag investors into open waters. The percentage of stocks above their 50-day SMA is not yet at rock bottom levels, so there is more down side risk. However, some investor sentiment measures are showing a high degree of pessimisms (which tends to be positive for stocks). 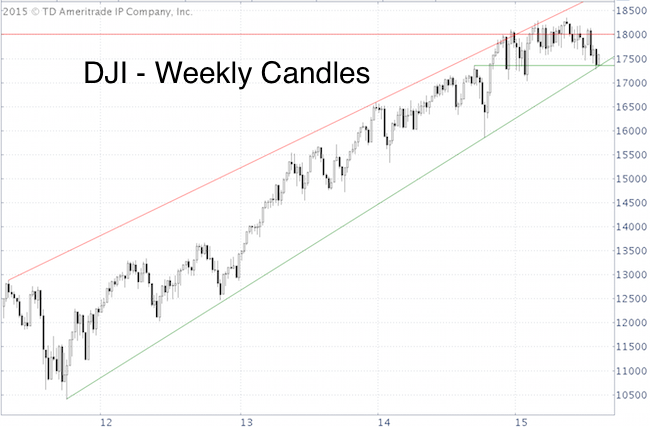 Bottom line, there is risk, but it seems to be somewhat limited, and will only be triggered by a drop below support (click here for key S&P 500 support). I would love to see a correction. The deeper the correction, the better the buy signal for a final hurray rally. If the S&P 500 doesn’t bounce soon, despite some excessively bearish sentiment readings, it could be a warning sign that a short-term break down is near. 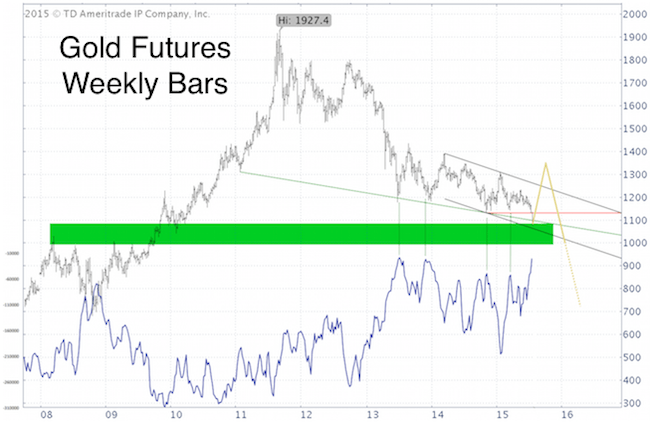 Click here to view the chart that suggested a gold rally was due. This week, gold gained as much as 3% (gold rallied as much as 5% from the July low). However, sentiment has quickly swung from long-term over-hated to short-term overbought. Based on sentiment and seasonality, the gold rally should continue for a while longer, once this pullback is complete. A drop below 1,100 would caution of a relapse to new lows. Continuous gold analysis is provided by the Profit Radar Report. 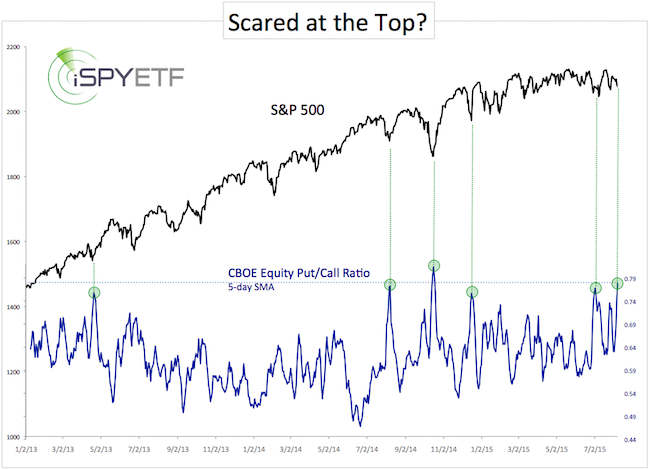 On Friday, the equity put/call ratio rose to the second highest reading in years. This means that option traders are loading up on put protection, an indication of unusual fear (consider that the S&P 500 is within two percent of its all-time high).